Let me tell you a little (a lot) about this cake. 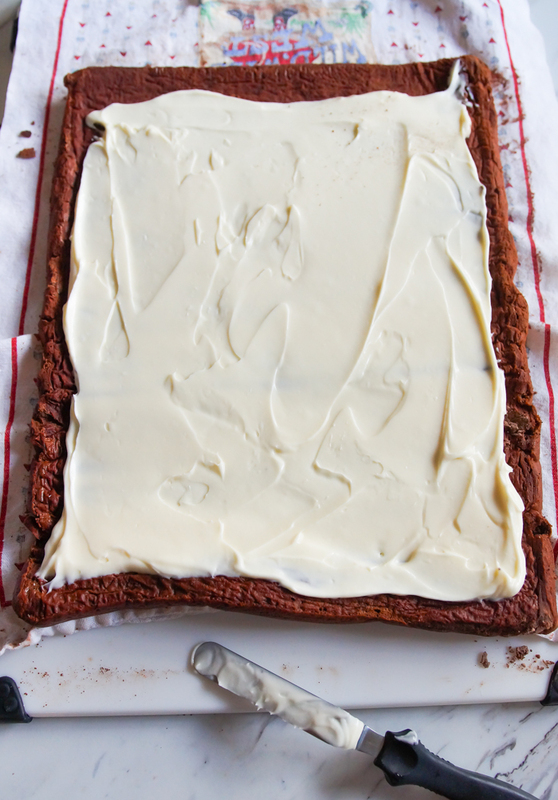 The cake itself is a flourless chocolate cake made airy and light from whipped eggs. 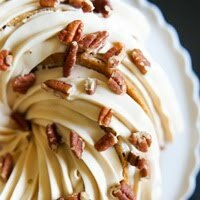 The center is a vanilla cream cheese topped studded with bits of pecan praline. The entire cake is enrobed in the richest chocolate ganache ever and is adorned with piped chocolate decorations. To answer your first question: YES. It is delicious. To answer your second question: YES. 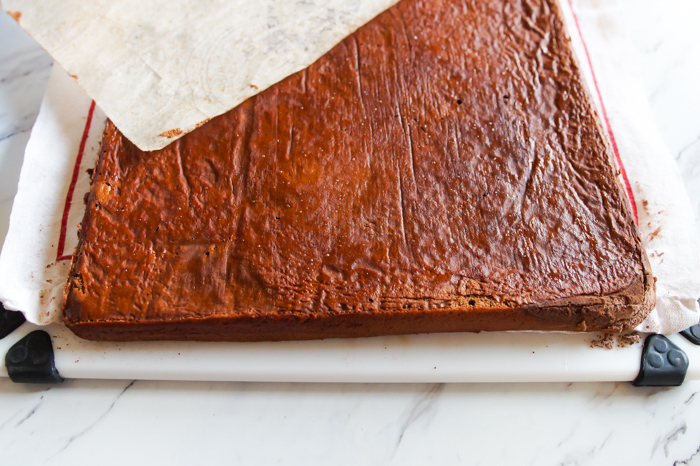 It is time-consuming, BUT you make this cake ahead of time...it gets better as it sits. When you eat it, you'll have forgotten all of the time and dirty dishes that went into making it. Promise. 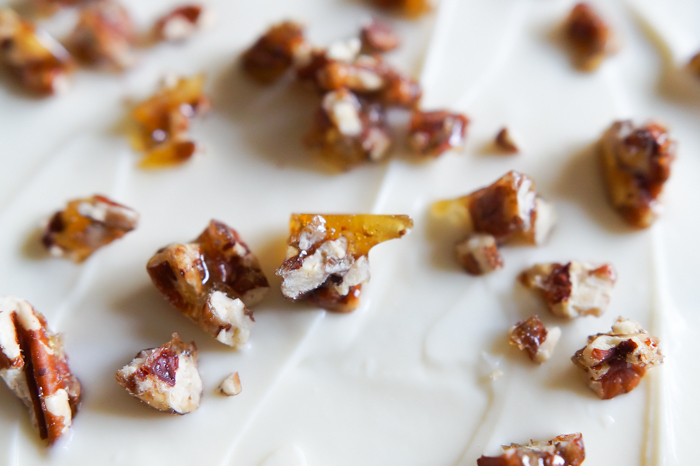 You'll start by making the pecan praline. 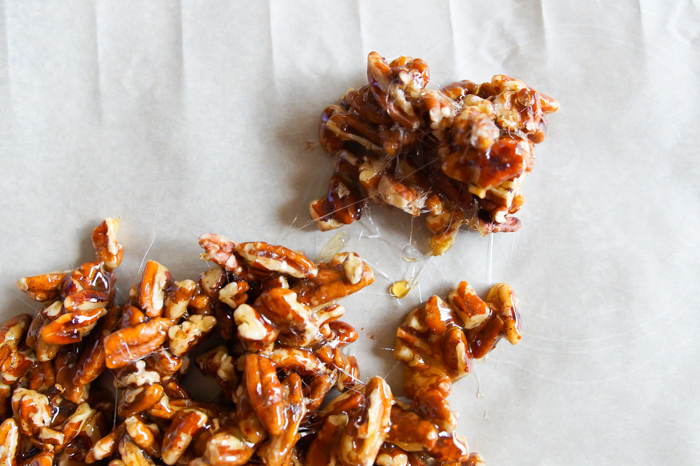 It's simple enough...just toasted pecans, water, sugar, and corn syrup. 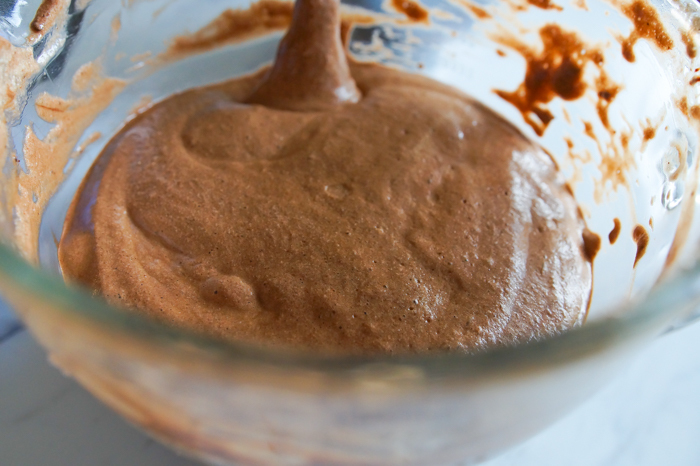 Pour it onto a cookie sheet and let it cool. 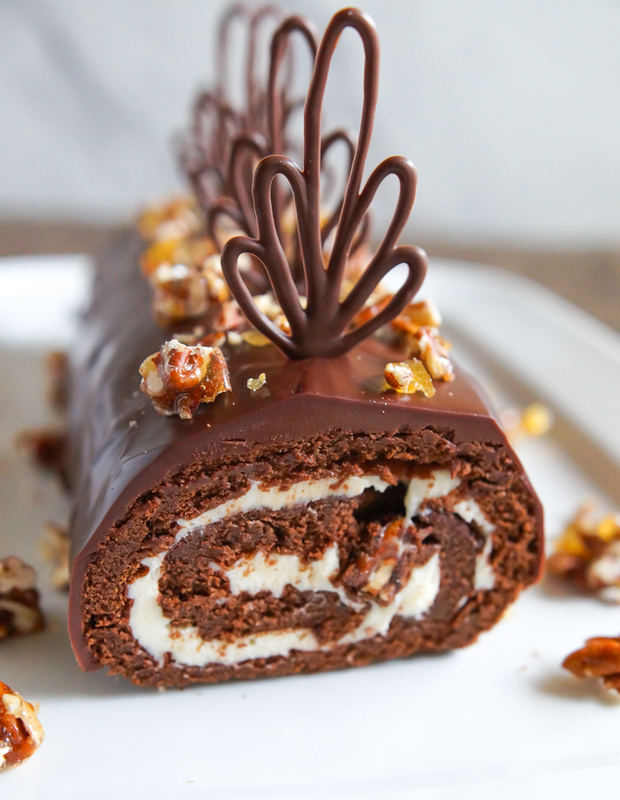 The chocolate decorations can be made in advance (or you can skip them). 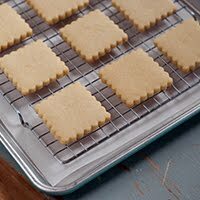 They are EASY, though, especially if you use melting wafer instead of tempering chocolate. I used these Ghirardelli melting wafers. 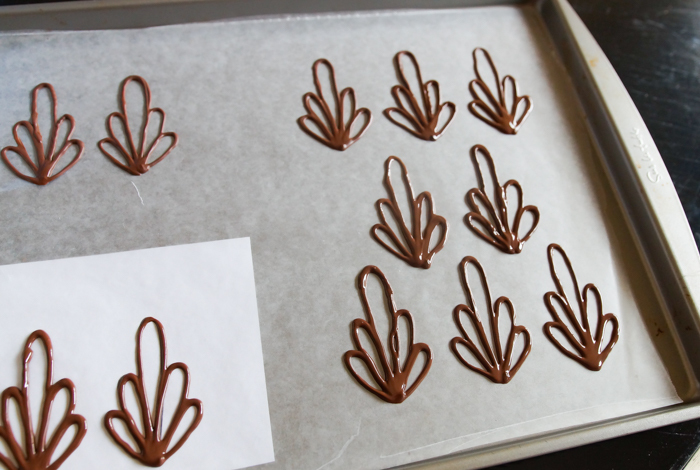 Melt the chocolate and pipe designs onto a waxed paper-lined cookie sheet. I used a template that I found online for the design. Pop the piped designs in the fridge until ready to use. (Search "chocolate templates" on Pinterest.) PRO TIP: Make extra for breakage AND so you can eat them! 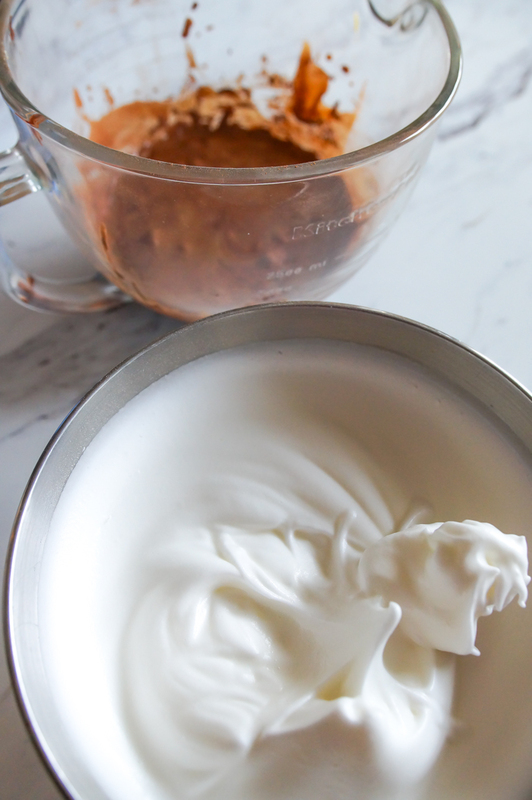 To make the cake, you'll fold whipped egg whites into the chocolate batter. Once baked, you'll cover the hot cake with a dish towel. (Be sure to use one that isn't fuzzy.) Line one short side up with the towel. 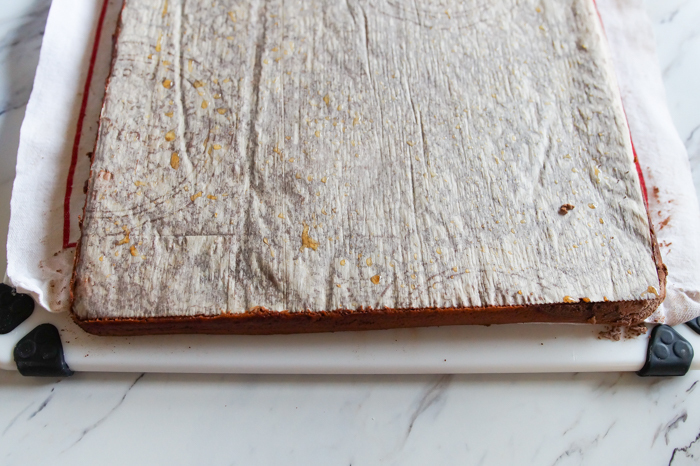 Place a large cutting board on top and invert the cake. The towel will be on the bottom. 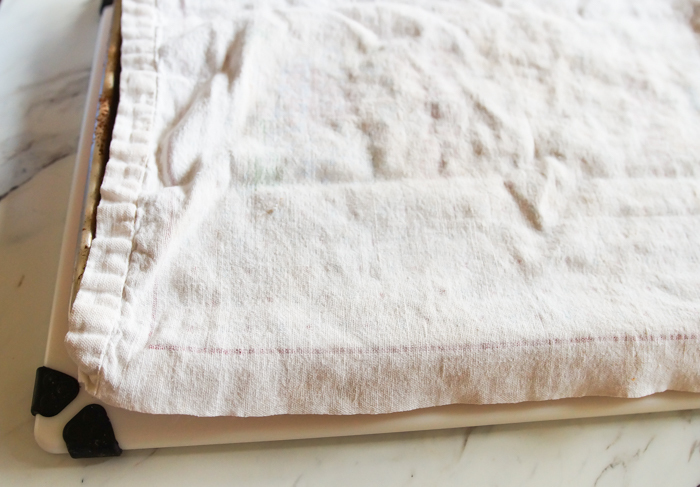 Peel off the parchment. 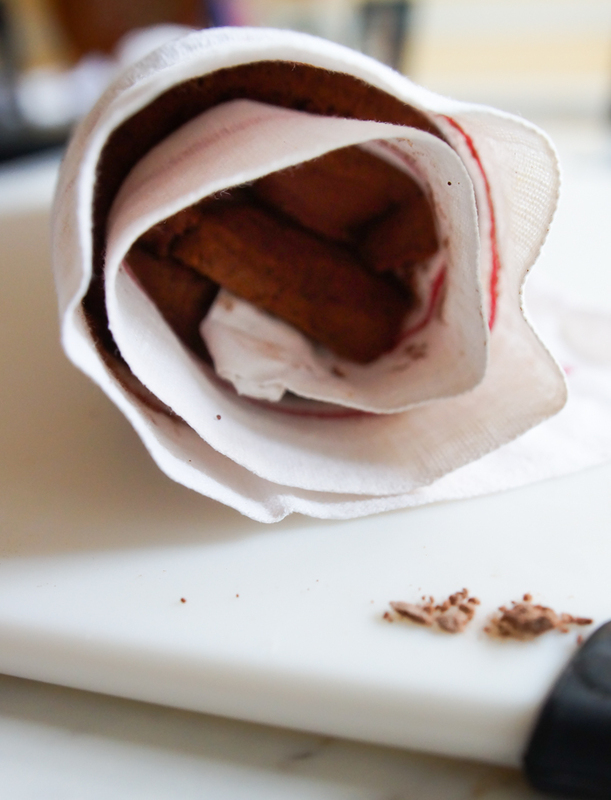 While the cake is still hot, roll the cake with the towel inside, starting with the short end of the towel. You'll leave it rolled in the towel for a bit. This helps the cake "remember" the rolled shape and makes it less likely to crack once filled and rolled. When the cake is unrolled, it'll look funny. That's ok. 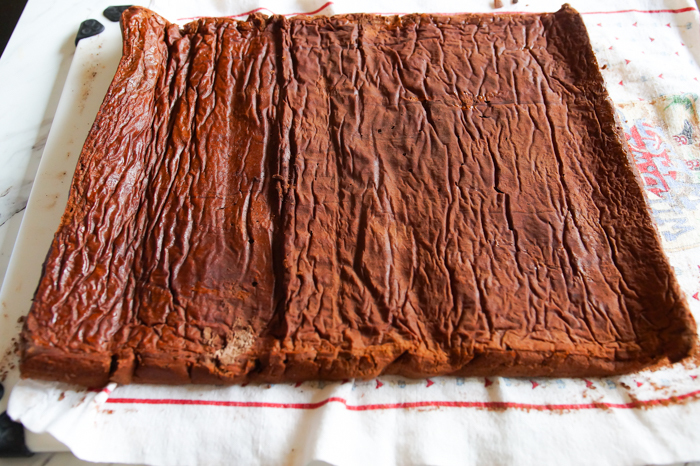 The ends should curl slightly upward, and the surface will look wrinkled. Let cool. The filling comes together quickly. When the cake is completely cooled, spread the filling onto the cake. For easy rolling, have one short side of the cake facing you. Leave more of an edge on the far short side. 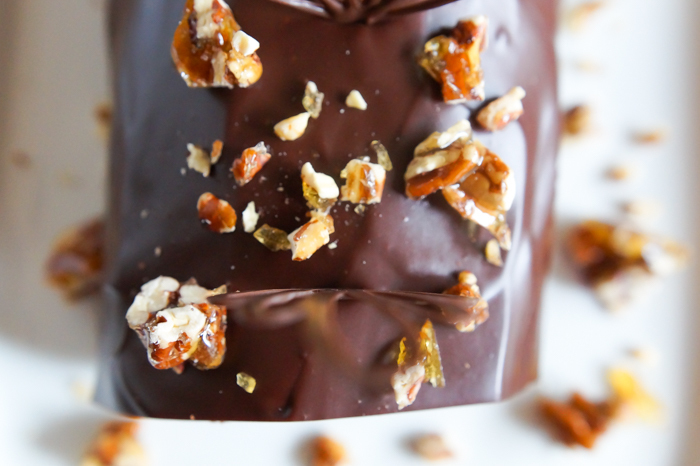 Chop the praline, reserving some for the top, and sprinkle over the filling. Roll the cake (without the towel this time!) and place on a wire cooling rack placed over a rimmed baking sheet. Refrigerate. Make the ganache...y'all this one has cream AND butter. 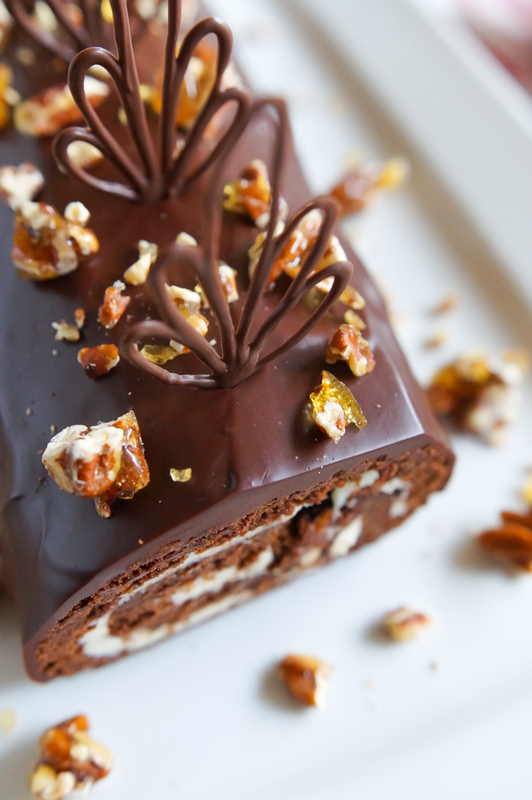 It's rich and thick and shiny and all-of-the-other-food-adjectives. 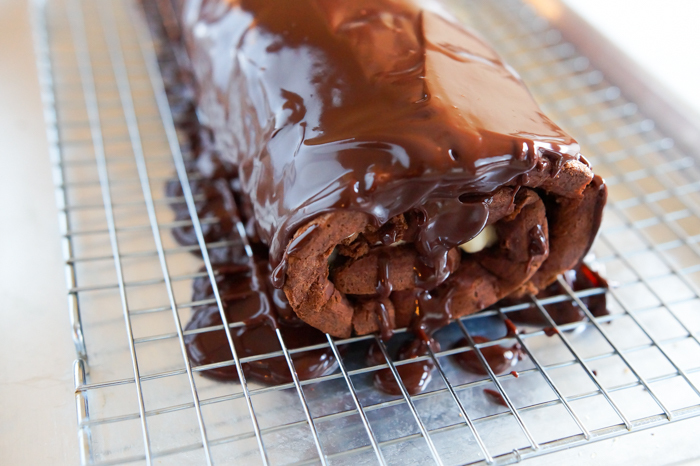 ;) Pour the ganache over the cake. Refrigerate the cake for a minimum of 4 hours, up to two days. 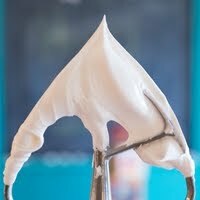 Before serving, cut the ends of the cake to reveal the swirl on both ends. Peel the chocolate decorations from the waxed paper and place on the cake. 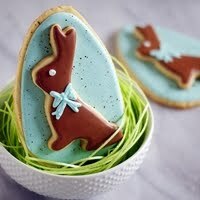 Sprinkle on reserved praline. 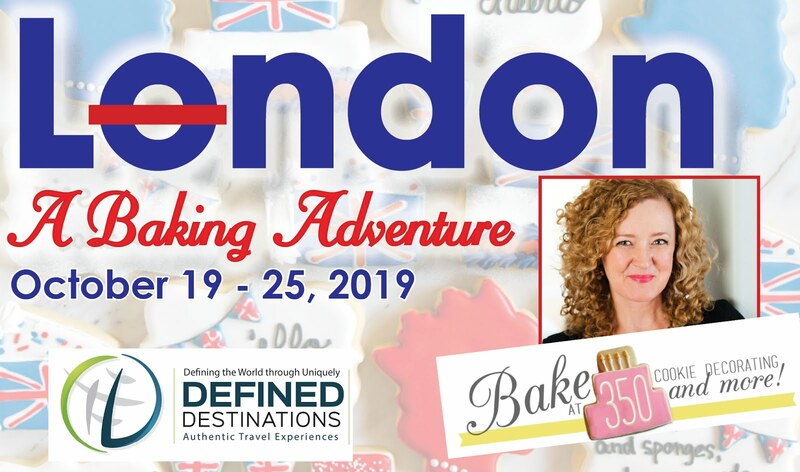 Serve and award yourself STAR BAKER! 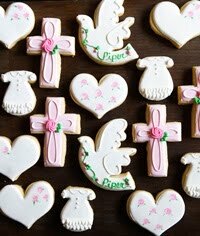 This is a show-stopper for Valentine's Day or any special occasion. 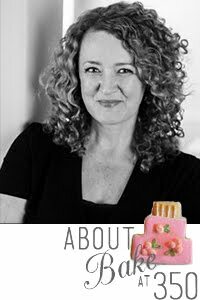 I'm sharing my recipe over on Imperial Sugar. Go get it! I think it would be Paul Hollywood-approved. Wow, this looks awesome. 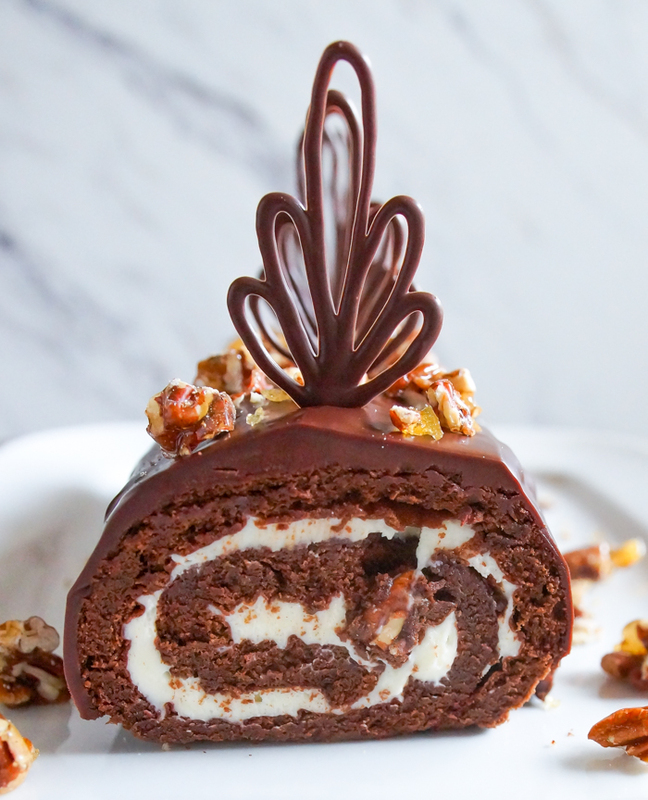 I've never made a cake roll but that may soon change. Thanks for such an awesome recipe. 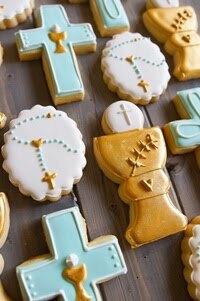 I am applauding:) Your piping skills were made for those decorations! 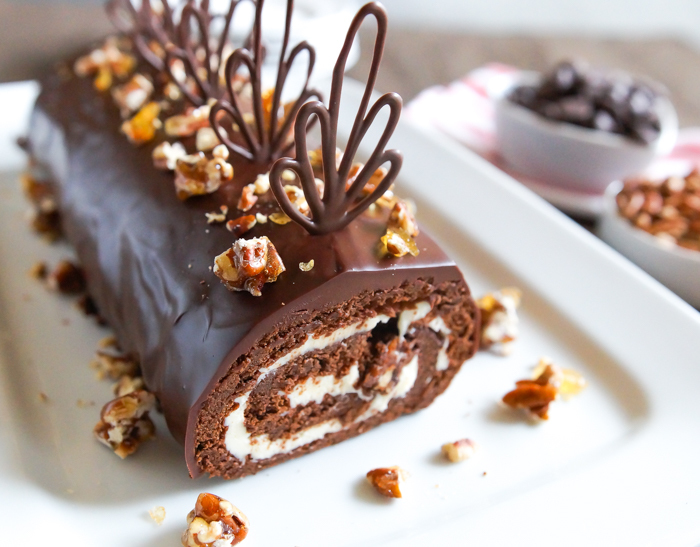 This roulade is gorgeous! Perfect for hosting! How do I store over night? Covered with Saran? Store it in the fridge...uncovered is fine.